Mesothelioma patients undergoing chemotherapy must be careful not to take any medicine, supplement or herbal remedy that could interact or interfere with their cancer drugs. Drug interactions can weaken chemotherapy or cause life-threatening side effects. There are a number of reasons patients with mesothelioma carry a high risk of experiencing adverse effects from drug interactions. In general, cancer patients typically rely on prescription and over-the-counter (OTC) medications to alleviate cancer symptoms and treatment side effects. In addition, a large percentage of cancer patients supplement their treatment with complementary and alternative medicine (CAM). Mesothelioma patients also may receive care from several different specialists at separate hospitals and clinics who may not coordinate prescription information. 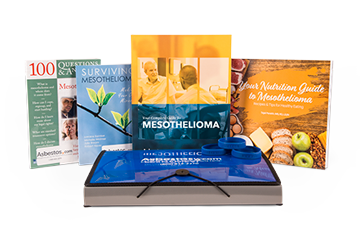 Finally, most mesothelioma patients are elderly and were likely already on many prescription medications before their diagnosis. Make sure each of your specialists knows about all the medications you are taking. Ask your doctor or pharmacist which over-the-counter medicines are safe for you. Consult your medical team before starting any alternative or complementary therapy. Eat a balanced, healthy diet rather than taking excessive vitamin supplements. Some drug interactions work against chemotherapy by reducing how much of the drug is absorbed by cancer cells. This type of interaction effectively lowers the dosage of the chemotherapy, killing fewer cancer cells. The more dangerous type of drug interaction, however, slows the rate at which a chemotherapy drug is eliminated from the body. This allows higher levels of the drug to build up in the body, which puts the patient at risk of organ failure. A toxic combination of drugs can be even more dangerous than malignant mesothelioma cells. The most common chemotherapy regimen for mesothelioma is a combination of pemetrexed (Alimta) and cisplatin or carboplatin. This list is not all-inclusive — many OTC and prescription medications can cause kidney damage in combination with chemotherapy for mesothelioma. The safest thing to do is ask the doctor who prescribed the chemotherapy what medications will be safe to take during treatment. While receiving chemotherapy, alert your doctor immediately if you experience symptoms of kidney damage such as little or no urination, abdominal swelling or rapid weight gain. Other types of drugs can be dangerous for mesothelioma patients receiving chemotherapy. For example, vitamin B6 supplements and certain seizure medications can interact negatively with cisplatin, and chemotherapy patients are strongly advised not to receive live vaccines such as shingles vaccine or the nasal flu vaccine. The injectable flu shots are inactivated, and your doctor may advise you to have that injection every year. On the other hand, keep in mind doctors usually prescribe several specific medications to prevent or alleviate the side effects of chemotherapy. Most chemotherapy patients are given medication to prevent nausea, and patients receiving pemetrexed should receive folic acid supplements and vitamin B12 injections. The vital thing to remember is to always ask your health care providers how a drug may interact with the other medications and supplements you are taking. Seeking treatment from a medical team at a specialized cancer center can reduce the risk of different doctors writing conflicting prescriptions, but you must still be proactive about understanding your treatment plan and preventing negative drug interactions. Aside from drug-to-drug interactions, medications can also interact negatively with certain foods, herbs and supplements. Drug interactions are complicated and often counterintuitive. Nutritional and herbal therapies usually are not as well researched as mainstream medications, which makes it even harder to predict what problems they may cause when combined with chemotherapy. For mesothelioma patients, some popular nutritional therapies may actually work against chemotherapy. Vitamin C is essential to good health, but an excess of vitamin C can reduce the effectiveness of chemotherapy drugs such as cisplatin and doxorubicin. Turmeric, a spice purported to reduce inflammation and prevent cancer, is known to inhibit the action of certain chemotherapy drugs. St. John’s wort has a long history as an herbal remedy for mental health issues and other ailments, but it can weaken several types of chemotherapy drugs and other prescriptions. Grapefruit juice is a popular health drink, but it is also known to diminish the effectiveness or increase the side effects of various medications. Another complex case involves so-called superfoods such as mangosteen, lemongrass, pine bark and acai berries, which are high in antioxidants. Many people tout the ability of antioxidants to neutralize “free radicals” — volatile molecules that can damage the body’s cells, potentially leading to cancer. However, most people do not realize many chemotherapy drugs use free radicals to attack cancer cells. For this reason, patients receiving chemotherapy may be advised to actually avoid foods and supplements high in antioxidants. Medical marijuana, derived from the Cannabis sativa plant, has earned a positive reputation for helping cancer patients cope with chemotherapy side effects and potentially even control tumor growth. However, the complicated legal status of marijuana in the United States has prevented adequate clinical research on medical marijuana and related therapies such as CBD oil (cannabidiol). Because cannabis-based therapies also vary widely in dosage, administration and chemical composition, each individual patient faces different risks of drug interactions. Researchers have documented negative interactions between the chemical components of cannabis and various medications — including certain types of chemotherapy — so it is unwise to assume combining chemotherapy with any marijuana product is safe. The key is to be open and honest with your health care providers about all the treatment options you pursue. Keeping alternative therapies secret from your doctors or forgetting to tell them about your OTC medication use is a recipe for disaster. Drugs.com. (2017, December 3). Carboplatin. Drugs.com. (2017, December 3). Cisplatin. Mayo Clinic. (2017, October 24). Marijuana. Orrange, S. (2016, November 9). The 10 Worst Medications for Your Kidneys. Drugs.com. (2015, August 4). Alimta. Horn, J. & Hansten, P. (2014, December 9). Drug Interactions with Marijuana. Labriola, D., & Livingston, R. (2014, July 25). Avoiding Antioxidant-Drug Interactions During Cancer Treatment. Simon Yeung, S., Gubili, J., & Cassileth, B. (2013, October 15). Herb-Drug Interactions in Oncology. Van Leeuwen, R. et al. (2011, October 1). Potential drug interactions in cancer therapy: a prevalence study using an advanced screening method. U.S. National Library of Medicine. (2010, September 1). Pemetrexed Injection. McCune, J. et al. (2004, June). Potential of chemotherapy–herb interactions in adult cancer patients.